Ladies and Gents, Tonight we have a special guest sharing his dance wisdom with us tonight. Right after Shinobi's Waacking class at 6:30P we have the talented Trevor Takemoto teaching us at 7:45P. Come get down with us tonight! We'd like to welcome some of our newest Staff Members to the Full Out Studios family! In celebration of their addition to staff, we're offering the class tonight @6:30 for FREE! 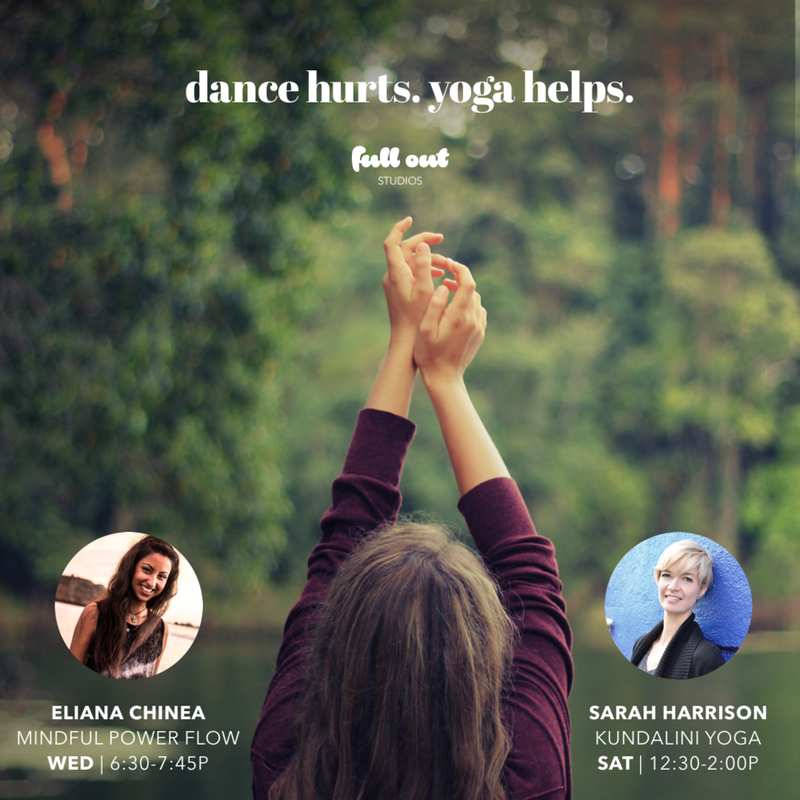 For those of you who were ever interested in yoga and wanted to try it out, now's your chance! Mats are limited! Bringing your own is highly encouraged! Sandwiched right between our regular Saturday classes is this lovely workshop. Featuring Eileen Kim @3:30PM and Richard Liu @5:00PM. Come early and take Daniel's All Level Hip Hop Class @2:00PM and stay after for Kevin's ADV Urban Choreo Class @6:30PM. See you there! We're excited to announce that we will be having our first #WeekendWorkshop series at the end of this month to celebrate the first month since opening the new studio. Mariel Martin will be kicking us off at 7:30PM. Registration opens at 7:00PM. 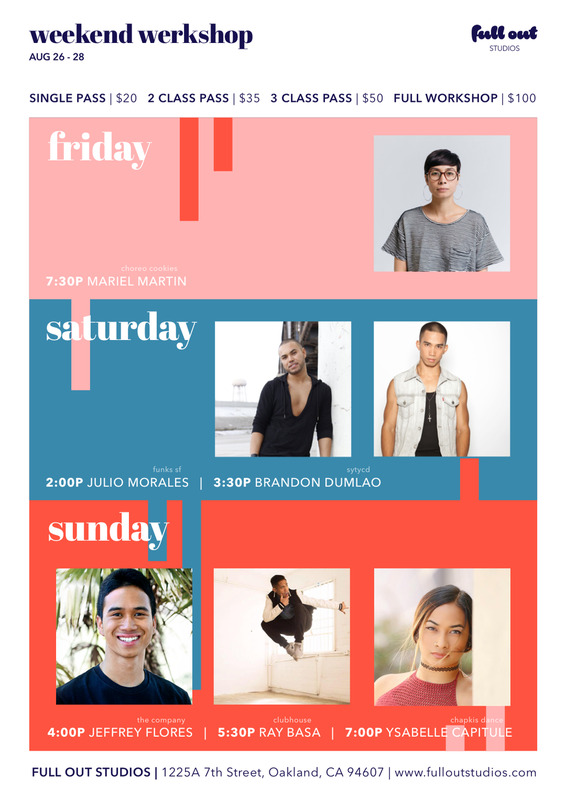 Julio Morales begins at 2:00PM followed immediately by Brandon Dumlao teaching at 3:30PM. Registration opens at 1:30PM. Jeffrey Flores teaches at 4:00PM, followed by Ray Basa teaching at 5:30PM, and lastly Ysabelle Capitule teaching at 7:00PM. Registration opens at 3:30PM. We will be hosting our very first Full Out Class at the new studio, EVER! Class will be taught by our friends Gina Hong and Kevin Garcia! Registration opens at 6:30PM and Workshop begins at 7:00PM. Join us for our first event at Full Out Studios! We will be giving an exclusive tour of the new space before it is fully built out. We will be screening "Preface" by Mari and Keone Madrid and will be serving gourmet popcorn and light refreshments! On top of that, we will be raffling off unlimited class passes. It's going to be a good time!